For a heavy duty work truck, the Ram cab and chassis trucks at Melloy Dodge are New Mexico’s most affordable and versatile solutions for commercial trucks. Available in the Ram 3500, 4500 and 5500 models, these heavy duty flatbeds allow customization on the bed for the business’ need. The Commercial and Fleet department staff at Melloy Dodge can also help the truck buyer with the customization, and often include it within the financing of the vehicle. The Ram cab and chassis trucks offer best-in-class towing, with the 3500 model pulling up to 22,770 lbs and a max payload of 7,640 lbs. The 4500 and 5500 models feature the largest front and rear brake rotors in their class. Diesel-powered models include a 5 year, 100,000 mile powertrain limited warranty, and the gas-powered models offer the 5 year, 60,000 mile powertrain limited warranty. 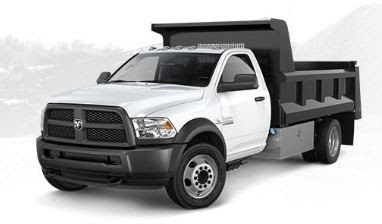 Whether you’re a plumber, pulling a backhoe or heavy duty trailers, or need a versatile and powerful truck, the Ram cab and chassis models are designed for years of hard work while providing durability and power. Melloy Dodge in Albuquerque is the metro’s only Ram Cab and Chassis truck dealership, as well as the authorized BusinessLink program. This Chrysler program is designed to provide business owners with sales and service benefits to keep them on the job. The no-cost BusinessLink program offers next-bay service, loaner vehicles, a dedicated account manager, financing expertise for business vehicles, extended service hours, and other benefits. The Melloy family has been serving the automotive needs of New Mexicans since 1955. Visit our dealership at 9621 Coors Blvd NW in Albuquerque, just north of Paseo del Norte. At Melloy Dodge, we always say “Deal”!